Plot: When Bond investigates the deaths of three agents in America, along with the CIA, he finds that there’s more to Harlem gangster Mr. Big and Caribbean dictator Dr. Kanganga than meets the eye. Getting mixed up in a plot involving the occult gives Bond more than he bargained for. Review: So enters Roger Moore, to date the longest standing James Bond. During his impressive seven movie run he cut more than a niche for himself in the franchise, facing some of the most memorable and ludicrous villains and situations the series has seen. Having come off the television series The Saint he was no stranger to playing the British gentleman spy and slips into the part with no hesitation. Although he doesn’t carry the menace that Connery gave the role he’s plenty comfortable playing the smooth talking agent and man of action. Moore also gives a very tongue-in-cheek approach to the material, delighting the in absurdity while Connery would play along with it. With Guy Hamilton in the directors chair once again, and the very different locale for the spy, Moore has ample opportunity to find his rhythm. Heading to New York certainly gives Bond a very different environment to work in. The story makes no secret of how much the suited Brit stands out walking into the ‘Fillet of Soul’ nightclubs. Seeing how Bond responds to a situation he’s so unfamiliar with and has no chance of blending in to gives the early acts of the movie a unique feel. With the script having been written for Connery we don’t have to contend with another hamfisted attempt by the producers to introduce a new Bond, but instead everyone acts as though it is business as usual, which is beneficiary to all concerned. 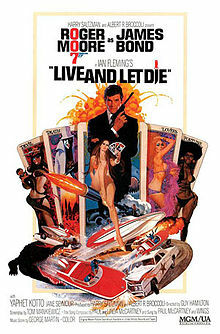 Later in the film the Bond-tropes kick back into full gear with big action, oddball characters and the slow-moving death traps we all know and love. 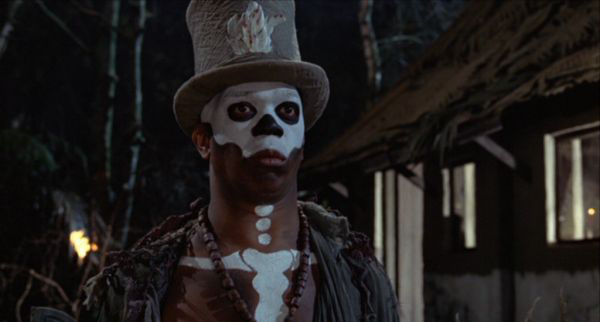 The Bayou boat chase, dangling above a pool of sharks and hopping over crocodiles have are among some of the most famous sequences in the franchise and Baron Samedi ranks as one of the coolest sidekicks. What lets this entry into the series down is that all these cool elements only serve to string together a typical Bond adventure. The concept for a story is there but it doesn’t get developed beyond that. Dealing with a real world issue – the power being held by drug dealers and the new availability of cheap product – is something that would make a much more engaging plot if it isn’t all but left by the wayside as a generic evil plot. Likewise, blending in elements of the occult and voodoo could’ve been an interesting concept, but is only used thematically. 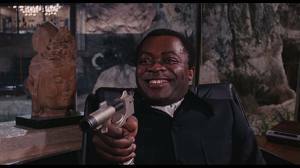 Yaphet Kotto plays a menacing enough arch-villain, but little is done with the dual identity of his character, leaving most of the best moments to his gaggle of sidekicks. On balance it is a fine adventure and a great introduction to a new Bond. Names is for tombstones, baby!